Below you will find Paper Mache Crafts projects and activities. You can make a lot of cool things with paper mache such as pinatas and masks. This is a project for older children—from seven to twelve. Tear several sheets of newspaper into small pieces. 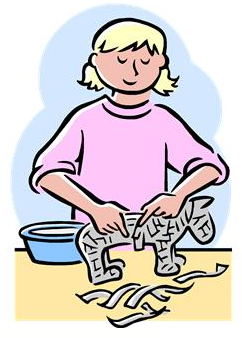 Put the paper into a container that will not rust, and soak the paper for 24 hours in hot water. Then shred the paper until it is a pulpy mass. Squeeze out the excess water and add flour paste until the pulp is of a consistency to model. Make a Paste with 1 Part Flour to 1 Park Water (meaning the same amount of water as flour). So if you use 1 cup flour, also use 1 cup of water. Now mix together the concoction to form a paste like consistency ... but still runny and not quite as thick as paste. Here is how to make the paste to use in making papier mache and in carrying out many of the ideas in this book. Mix together 1/2 cup flour with enough cold water to make a creamy mixture. Boil over a slow fire for 5 minutes, stirring constantly. Cool. Add cold water to thin if necessary. Add a few drops of oil of peppermint or oil of wintergreen to give a pleasant odor and to prevent the paste from spoiling. To store the paste, keep it in a covered jar in the refrigerator. This may be used to model animals or other figures, but it is particularly good for puppet heads. Weight a tall bottle with stones or sand and use the neck as a base for modeling a head. Don't attempt detailed features. Make a sturdy ball for the skull and work some of the paper down around the neck of the bottle to form the neck of the puppet. Let this stand several days till it is thoroughly dry inside and out. Paint the head with poster paints and finish it with shellac. Complete the puppet by making a dress and gluing on yarn or crepe paper for hair. Papier mache over inflated balloons will create interesting objects. 1. A large round balloon will lend itself to a globe for geography. It will also provide the foundation for two masks if the dried form is sliced in half like a melon. The strips of papier-mache are applied directly to the inflated balloon. If a mask is planned, the facial features may be modelled directly into the papier mache form or they may be attached later after the form has been sliced from the balloon and the openings cut for the eyes. 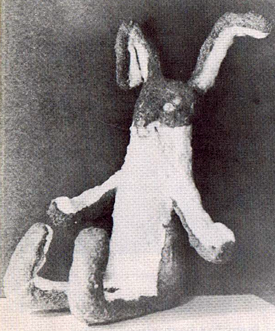 Features modelled into the form are built with papier-mache; features which are added later may be built with papier-mache'or they may be made from other materials and glued into place. 2. In the case of the globe, a relief map can be formed directly in papier-mache or added later with the salt and flour mixture. 3. The many balloon shapes available will enable you to find forms lending themselves to figures, animals, birds, fish, bowls, Christmas decorations, etc. Forms may be fastened together and used in combination with other materials to create complex objects. 4. These forms should be sanded, painted and shellaced. Papier Mache animals, figures, birds, fish, etc. can be built over frames of crumpled paper, chicken wire, window screen, etc. If the following procedure is followed, the skeleton is NOT removed. 1. 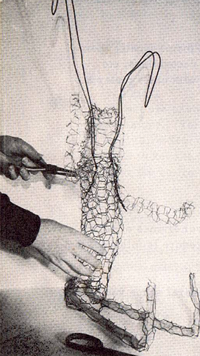 Form the wire, paper, screen or chicken wire into the general shape you desire, and fasten it with string, wire, or some other material. 2. To this skeleton apply the papier-mache as previously outlined. Particular details not present on the skeleton can be built directly onto the form. 3. Sand, paint, and shellac. 4. Decorative materials such as yarn, corn-silk, buttons, construction paper, etc. may be attached to the animal or figure. 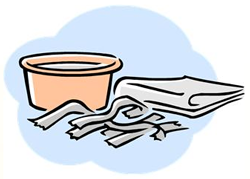 NOTE: Some people may prefer a papier mache pulp made by tearing newspapers or paper towelling into small bits and soaking these overnight in water. You then pour off and squeeze out the excess water, add paste and thoroughly mix together to a clay-like consistency. You will need Papier-mache (recipe is above) ; piece of wood 5 1/2" x 6 1/2" (or a size of your choice); wood stain; 2 brushes; 2 1/2" length tape; 4" length of string; glue; and poster paints or vegetable food coloring. Stain wood base and allow to dry. Decide what kind of design is to be made on plaque. Sketch design on wood and cover this area with glue before molding papier-mache in place (sketch a). Now make the papier mache from the recipe linked above. Cover the wood with glue and mold papier mache into place by dipping strips of paper into papier mache mixture and molding into place When molding is finished, allow 2 or 3 days for papier-mache to dry (sketch b). Then paint the molded object as desired with poster paints or food coloring (sketch c). When paint is dry, attach hanger. Knot each end of the string and place in loop fashion on back of plaque, near top. Tape loop to board (see sketch d). Papier Mache Bowls - Make these awesome Papier Mache Bowls. Papier Mache Stone Sculptures - This is a really cool idea. You start off with a rock and then you add a papier mache / clay like substance to make it into a sculpture. You can make all sorts of creatures and animals using this method. Make Your Own Papier Mache Bell - Mold your bell and make it last forever by using papier mache techniques and then painting it. How to Make Papier Mache Puppet Heads - For high quality puppets, you need a really good puppet head. Find out how to make one with this tutorial. Gesso Papier Mache Trays - Start off with paper plates and gesso and finish with a beautifully enameled tray to serve goodies on. Perfect for mother's day or a gift for someone else you love. Paper Mache Maracas - Make these realistic papier mache maracas with the balloon as the mold. Use pencils or sticks as the handles and mae sure to paint it afterwards. Milk Carton Log Cabins - Build a log cabin from a school milk carton, some Plaster or Gessor or Papier Mache, and some paint. Papier Mache Bowls & Dishes - In this craft, you use a glass jar as the mold and then papier mache around it.